Having wooden furniture in your patio or backyard is a beautiful thing, but it can pose plenty of issues as well. The weather is not sunny all the time and you will have to protect the furniture you have. Today we are going to learn more on how to waterproof wood furniture for outdoors. We will look at the challenges you need to face, as well as different types of materials and solutions you have in this situation. Most of the furniture items designed for the patio are biodegradable, which is why you need to know how to waterproof wood furniture for outdoors. Ideally, you should choose pieces made of treated lumber or other species that resist to rotting, such as cedar, redwood or teak. 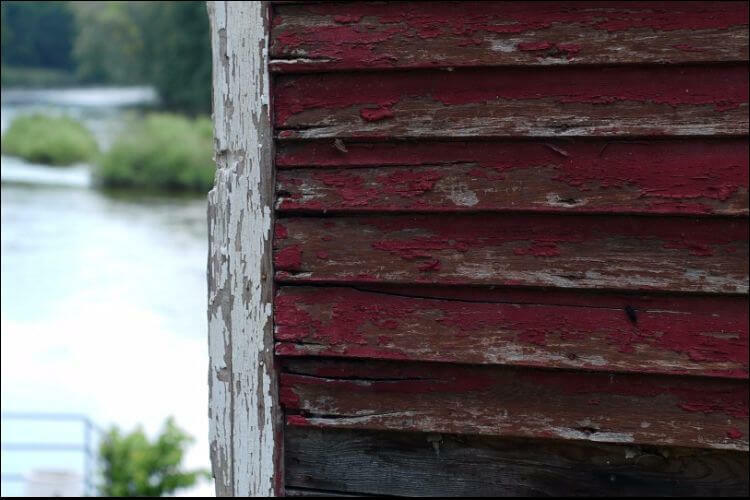 However, even these types of wood aren’t going to last forever so they still need some maintenance. That’s why you should also learn how to clean outdoor furniture correctly, to prevent it from quickly deteriorating. If you have a look at the standard furniture and the way it’s built, you’ll see that it has different types of interior glues and finishes. Mostly, they are made for buildings that are climate-controlled. 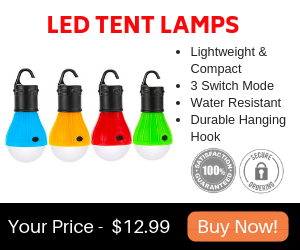 As such, when you place them outdoors, you expose them to various temperatures and moisture levels. Under these circumstances, the glue found in their joints can loosen. At the same time, the finish can degrade, thus deteriorating the furniture. If you want to prevent this from happening, you should make sure the furniture you buy for the outdoors is made with waterproof glue, as well as exterior finishes. Naturally, an outdoor furniture item should be built with a sturdy construction. 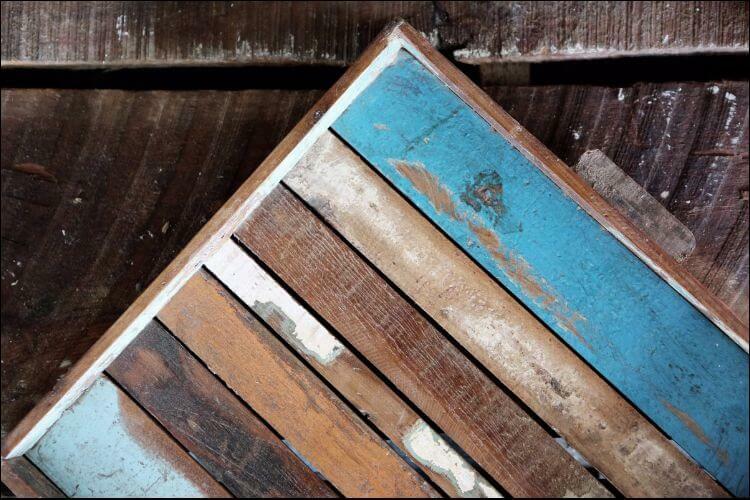 Check for thick pieces and joints so that there is less wood exposed to natural elements. In comparison, the indoor furniture has a delicate look, with thin pieces and fine joints and veneers. Obviously, if you are going to place it outdoors, all these will represent an invitation for warping, moisture, and disintegration. Contrary to what it might seem like, it’s not hard to learn how to waterproof wood furniture for outdoors. You just need to pay attention to the types of products you are using. Next, we will show you some advice on what to use and when. 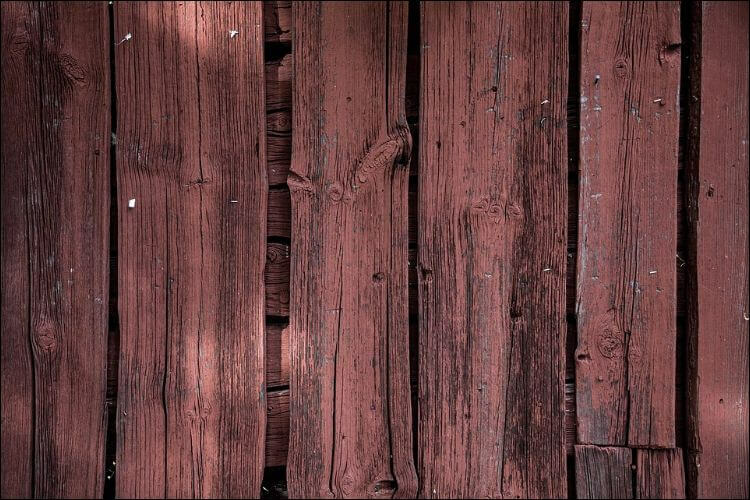 All raw wood needs a type of coating that would act as a sealer against water and a barrier against ultraviolet light. 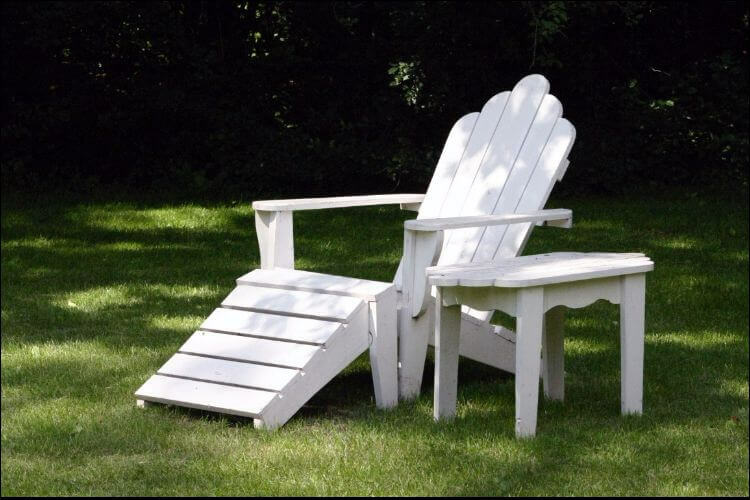 Latex paint is one of the most common ones used for coating outdoor furniture. 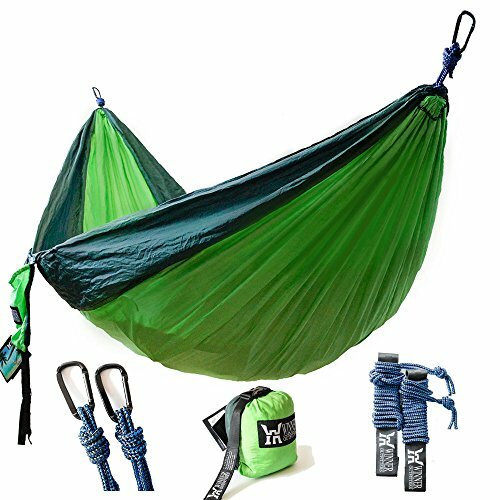 It offers versatility, durability, as well as various levels of protection. The latex seals the wood fibers, thus protecting them from any kind of water penetration. The best part? You can find this paint in all colors, so there’s no limitation for your design. 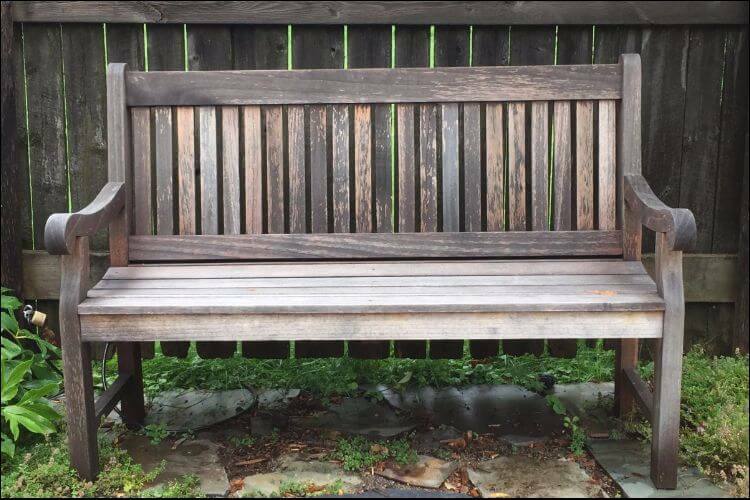 This is a great alternative to paint if you want to learn how to waterproof wood furniture for outdoors, but don’t want to use latex. Truth is, paint usually takes away the attention from the details of the wood grain. Moreover, the wood won’t look as pure anymore. It’s extremely important to make sure you use exterior varnish since you need it for your outdoor furniture. For extra effectiveness, you should use marine spar varnish, but be aware that this will dry darker than the natural shade of the wood. As such, if you have light grains, you might want to use a different wood stain or water sealant. Both options presented above are great for sealing the wood from water, offering it an appealing coating and protecting it from the sunlight. However, if you’re looking for alternatives on how to waterproof wood furniture for outdoors, wood stains and water repellents are great as well. The waterproofing stains have the advantage of protecting your furniture while also helping you have the color you want for the piece. The best part about it is that it lets the wood move naturally, as well as allow for the water to evaporate in its own rhythm. These things help the furniture not rot or split in time. The downside is that waterproof stains don’t last as long as the other options do. What does this mean? You need to reapply it every 2-3 years if you want to get the best results. Before applying any of the solutions we showed above, it’s important to sand the wood. This helps the primer adhere well. Alternatively, you can also use a chemical wood stripper. Don’t forget to wear a respirator mask when sanding it to bare wood. One of the most common mistakes people do when they learn how to waterproof wood furniture for outdoors is not sealing it completely. It’s essential not to leave any part of the wood unfinished. Make sure you seal all the nooks and crannies and fill all the cracks found in the furniture. Check the joins, the underside of the furniture and the bottoms of the legs. If it’s easier for you, just imagine you are encapsulating the entire furniture item, not covering it. You might say you chose the best products out there, so you don’t need to re-coat your outdoor furniture. However, this isn’t true. Any products you choose will lose their efficiency in time. 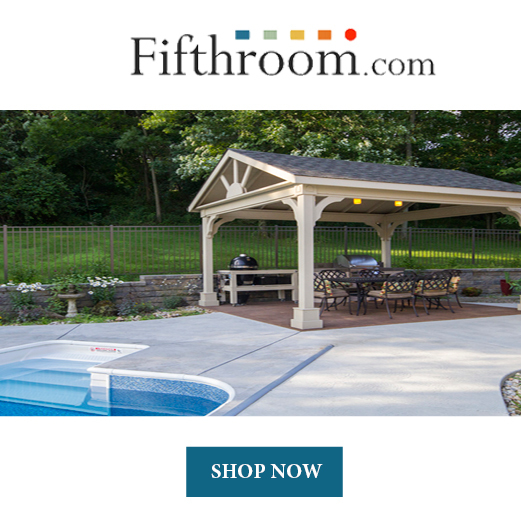 Moreover, even the best outdoor patio furniture will be affected by the weather conditions. Just like we mentioned above with the sealers, you need to repeat this process every 1-2 years. If it’s hard to remember it, you should write it down and keep track of the last time you recoated your furniture. If it’s possible, you should try as much as you can to protect the furniture from rain and sun. For example, instead of placing it in the backyard, you could keep it on the porch. Another good idea is to use some furniture glides. This will help the piece stay slightly raised off the ground. In this way, when it rains, the wood won’t sit in a puddle. 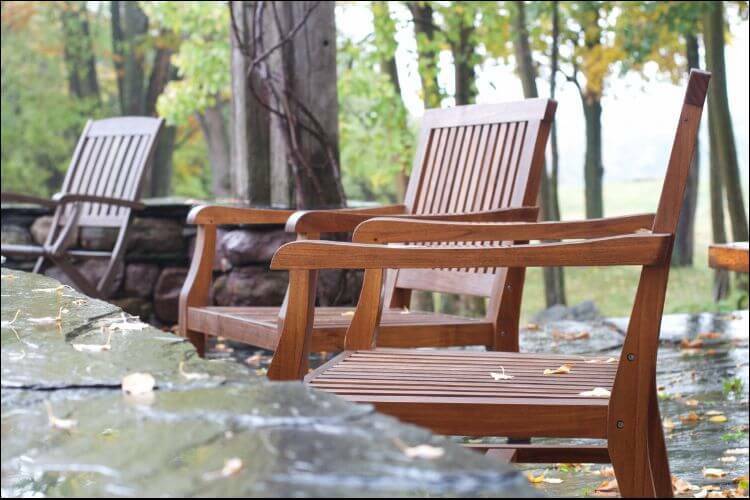 Now that you know how to waterproof wood furniture for outdoors, you should also know more about other materials. Let’s have a look at how you can protect outdoor furniture made of wicker and metal, for example. Wicker furniture should receive two coats of paint. As we said, the color of the paint depends entirely on your taste and your current design. When you’re done, apply one layer of spray marine varnish. One example is the Minwax Helmsman Indoor/Outdoor Spar Urethane, which you can find online. The main problem with wicker is the fact that it keeps moisture inside easily. Once it gets under the finish, water will damage the fibers starting from the inside. As opposed to a regular spray lacquer, it’s better to use varnish since it’s strong enough to seal out any type of moisture. Once again, we should mention that it’s important to repeat this step every 2-3 years and apply a fresh coat. In this way, you obtain a durable finish that is also water-resistant. Even if your metal furniture item is in a rough shape, you can still save it. Start by sanding off as much peeling paint and rust as you can. Remember to protect yourself by using a mask when you’re doing it. Next, use a fish-oil-based primer to treat the material. One option is the Rust-Oleum’s Rusty Metal Spray Primer. This substance is great because it helps prevent any corrosion. Moreover, it manages to bind to the rust, thus creating a surface which you can then paint. Finally, apply a fresh coat of paint in whatever color you want. If you already have a piece of furniture that is rust-free, you only need to apply a coat of spray paint. Just as an information, you should know that black paint is the best in protecting an object from the sunrays. The ideas we mentioned above are extremely useful if you want to know how to waterproof wood furniture for outdoors. 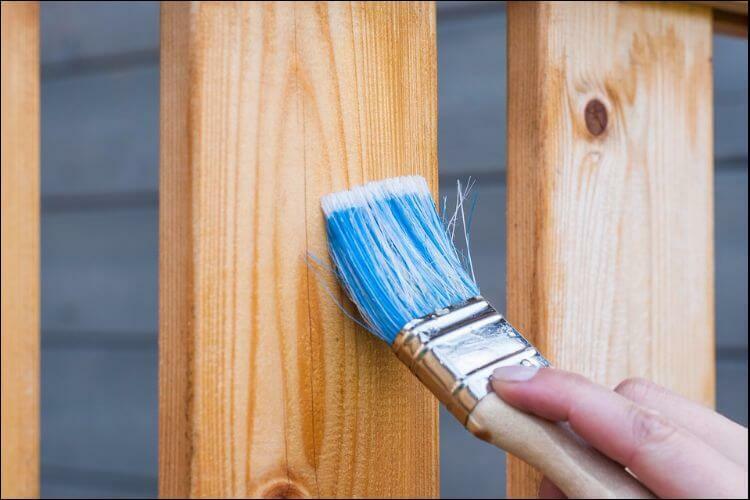 You can use (spray) paint, sealers, and repellents to create a barrier between the material and the rough conditions outdoors. At the same time, it’s important to repeat the process every couple of years if you want to get the best results. Finally, you can also take some prevention measures, such as storing wooden furniture indoors when it’s raining or snowing. Alternatively, there are also some special waterproofed or vinyl canvas which you can use to cover up your chairs or tables.